The Moog Modular sold between 1964 and 1981, and each module cost up to $1300. Robert Moog didn't create the first synthesizer; nor was his modular system the only game in town when it was unleashed on the public back in 1964. Yet it was Moog's modular system that would become associated with synthesizers in the public mind. Why? Well, for a start, Moog's instrument - as complicated as it was - was designed to be used by musicians. Simply put, Moog listened. When Vladimir Ussachevsky proposed the four-stage ADSR envelope, Moog listened; when Wendy Carlos offered up suggestions on how to improve performance, Moog listened. In fact, the entire endeavour was kickstarted when Moog met composer Herbert Deutsch in 1963. It was Deutsch who suggested using a simple organ-style keyboard to control the instrument. This single addition gave this mind-bogglingly complex Moog system something with which any musician could identify: it made it clear that this was a musical instrument, despite the fact that it looked like something out of a mad scientist's laboratory. Additionally, many of Moog's design flourishes have become standards. His use of voltage control and the introduction of the volts-per-octave pitch control are now predominant in analogue synth design. Voltage control allows one to modulate parameters like filter frequency or pitch from various sources, such as an LFO or envelope generator - a method of sound design that still informs the way synthesizers are made. Moog's system consisted of around 70 modules, housed in walnut cabinets or Tolex-covered portable cabinets. Modules were connected with patch cables. There were (initially unstable) oscillators, sequencers, envelope generators and amplifiers, mixers and that now-ubiquitous 24dB low-pass filter. If any feature defines the "Moog sound", it's that filter, with its zippy resonance and ability to self-oscillate - it's unmistakable and, seemingly, quite difficult to emulate precisely. Needless to say, the 'Moog sound' has been something of a holy grail to soft synth developers, some of whom have been more successful than others in capturing that elusive character. 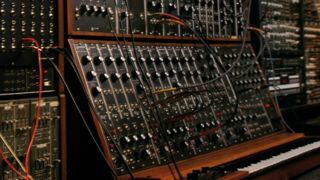 Those wishing to recreate the experience of using a Moog Modular system can turn to the many hardware modular systems currently on the market, or even to software modular synths. Some recreate the experience in full, with dangling patch cables and pixel-perfect faux wood cabinetry; others take the idea into the modern age, with deep modular environments that bear more resemblance to programming languages. Most of us will have to settle for the copies. Moog's modular systems have become highly prized collectors' items, with even small systems selling for astronomical prices. Of course, if you're lucky enough to be able to afford one, you'll be getting a piece of musical history. Previous owners include Tangerine Dream, Klaus Schulze, The Beatles and the Rolling Stones; current users include Mark Shreeve (Redshift), Ed Buller (Node), and Moog have recently recreated Keith Emerson's system. This one will get you as close as possible to the experience of using the original, with its dead-on interface and full complement of modules patterned after the real thing. Initially, the Modular V was blessed by Dr Robert Moog himself, and the famous Moog logo took pride of place on the GUI. The sequencer module is particularly nice. Not an emulation of the Moog system, nor a graphical language-style modular, this one lies somewhere in between, with a comprehensive collection of modules including a terrific filter with Moog-style low-pass mode. Virtual patch cables are used but don't obscure the modules' controls. An excellent tool for education and creativity. Available for iOS, Pulse Code Modular provides up to 31 modules that can be arranged in a vertical "cabinet" and patched with virtual cables. It may not sound like a full-blown Moog system, but it's great fun. The free version comes with enough parts to get you going, and additional modules can be had via in-app purchases.